In 1934, the Swiss air arm, or Fliegertruppe, called upon the EKW (Eidgenossische Konstruktions Werkstätte, or Federal Construction Workshop) to design a new airplane that could combine the roles of fighter, reconnaissance and tactical support aircraft. EKW’s efforts to fulfill such a difficult requirement produced two very different blueprints. The C-35 biplane and the C-36, a monoplane with a metal cantilever-wing structure. The Swiss government judged the C-35 a surer prospect and the first of 80 production aircraft entered service at the end of 1937. When war broke out in Europe in September 1939, the Fliegertruppe stepped up its patrols to guard its borders against both German and Allied intruders. At the same time, the C-36 blueprints were reconsidered. By this time EKW had become EFW (Eidgenossische Flugzeug-Werke), and the team at Emmen flew the first of the new aircraft on 23 February 1939. The C-36 had developed into a modified sub-type with twin tail fins designated C-3601, powered by the same 860-hp Hispano-Suiza 12Yers engine as the C-35 but now with a variable-pitch propeller. On November 30, a second. aircraft, designated C-3602, flew with a 1000-hp Saurer-built 12Y-51 engine and more reasonable speed of 510 km/h (317 mph). Following flight tests, modifications were made and an initial batch entered production as the C-3603, first flown on November 23, 1941. Ten were built, and after service evaluation a further 142 followed, serving with the Swiss air force between 1942 and 1952 in the combat role. Ordered into production by three manufacturers—the Eidgenossische Flugzeugwerke (Federal Aircraft Factory, or EFW) at Emmen, Doflug at Alterirhein and Pilatus Allgemeine Gesellschaft at Stans, in 1942, the C-3603, as the principal operational variant was designated, entered service with the Fliegertruppe as a long-range reconnaissance and ground support plane. Two others, designated C-3603-1 TR, were produced for training and parachute tests. In 1945 a C-3603-1 was converted for target-towing. Further improvements followed, and in 1946 Farner-Werke at Grenchen converted a C-3603-1 into a more advanced target-tug. A long tube was fitted from the rear cockpit to eject the target sleeve above the taiiplane and between the twin fins, with a cable-cutting device available to the pilot. Twenty C-3603s were converted to this standard. Unlike its predecessors the C-3603 had retractable landing gear, the legs folding to the rear with the wheels turning 90 degrees to lie inside the wings. Pilot and radio operator/ navigator sat under a 'greenhouse' canopy, the latter having a pair of 7.5-mm (0.295-in) machine-guns. Two more such guns were fixed in the wings, and a 20-mm (0.79-in) Hispano fired through the propeller hub (engine was the same as the C-3602). Racks under the wings carried up to four 100-kg (220-lb) bombs or ten rocket projectiles (from 1945). By 1944 a total of 160 had been delivered and they remained in operational service until 1953. The C-3603 was designed under the direction of EKW chief designer, J.Branger, and was just entering production when the Fliegertruppe was faced with a choice regarding engines and fuel. Until 1939, Swiss aircraft had relied on normal, high-octane petroleum fuel, which had to be imported and which might be in short supply due to the exigencies of war. If so, their flights would have to be limited to conserve existing stocks of the fuel. The alternative was to use K fuel, a wartime synthetic fuel produced at the Ems wood-processing plant. In order to maintain the level of crew training, the Swiss military decided to use the K fuel. The C-3603s then had to be modified to use the synthetic substance, and the designers were able to in-corporate the necessary modifications into the C-3603-1 smoothly enough for production at the EFW plant of that newer variant to proceed in 1942, without a lag in overall production of the C-36 series. The C-3603-1 was powered by a 1,000-hp 12-cylinder Hispano-Suiza HS-51 12Y engine, built under license by SLM Winterthur and Adolph Saurer Allgemeine Gesellschaft in Arbon. Another wartime modification of the C-3603s was a change in the landing gear. After all Swiss tactical airfields were provided with paved runways, the plane’s wheel fairings, which were very unpopular with the maintenance staff, were removed. A floodlight was installed in the front portion of each undercarriage fairing to illuminate the taxiways during night flying operations. 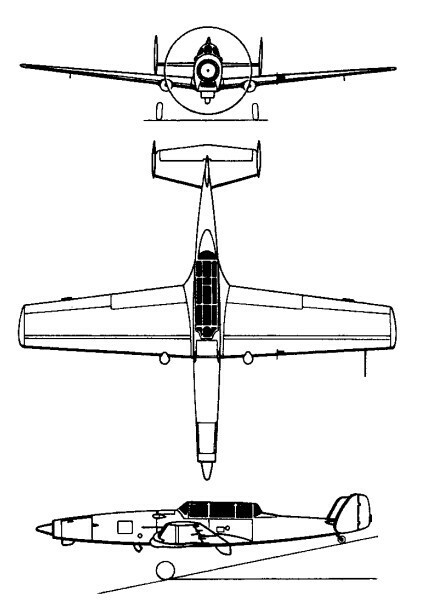 By 1944, 144 C-3603s had been built, and six C-3603-ls would be added be-tween 1947 and 1948. Stored components then were assembled into 11 complete air-craft, given 1,250-hp / 933kW Saurer YS-2 engines and designated C-3604s. On August 21, 1944 the faster C-3604, with three forward -firing cannon, made its first flight and was rewarded by an order for 100. The type entering service in 1947-48. Spares produced for the C-3603 and not used enabled a further six C-3603-1 s to be assembled in 1948. But within a year negotiations had been opened with de Havilland for manufacture of Vampire jets, and only 13 of the C-3604 model were built. All these machines stayed on Flugwaffe strength. In 1945, a C-3603-1 was converted into a Sehlepp, or target tug, and in 1946, the Farner Werke at Grenchen a more advanced ver-sion was evolved and fitted to 20 other aircraft within a year. During the early 1950s a requirement for an aircraft to tow illuminated targets at night was met with the conversion of a C-3603-1, and this machine remained in service until replaced by the C-3605 in 1972. By 1953, all 60 surviving aircraft had been converted to that role. Further conversions of 40 C-3603-1s to target-tugs began in 1953, while another aircraft was fitted beneath one wing with a winch built by ML Aviation in the UK for high-speed towing, and a ballast tank beneath the other wing. In the same year, 20 more C-3603-1s were converted by the military at Dubendorf for catastrophe relief using underwing supply containers. In the mid-1960s, Jean-Pierre Weibel, in charge of the EFW’s Structures Department, proposed that a new engine be adapted to the existing airframes when the Hispano-Suiza engines of the 40 C-3603-1 conversions began to wear out. The choice of a suitable engine was an 1,150-hp Avco Lycoming T53-L-7 turbo-prop. In September 1967 the idea was approved and work began on the conversion, which was to involve the minimum possible amount of alteration to the airframe. At 555 pounds, the T53-L-7 was less than half the weight of the original piston engine. That made it necessary to add an additional section to the nose to compensate for a serious change in the air-craft’s center of gravity. The 10-foot-9-inch-diameter Escher-Wyss V7 propeller was replaced by a Hamilton Standard 53C51 with a diameter of 9 feet 9.5 inches. New wheels with disc brakes updated the landing gear. The layout and instrumentation of the pilot’s cockpit was modernized, while a hydraulic drive supplemented the mechanical impeller for the SZW-52 winch in the rear cockpit. A third, central, fin was added. The overall result was a fuselage—now 39 feet 5¾ inches long— that seemed to extend as far forward of the wing as behind it. More startling than the airplane’s appearance, however, was its performance when the first prototype (actually, a modification of the 102nd production C-3603), serial No. C-502, began flight testing on August 19, 1968. Its handling qualities were excellent, and pilots also praised its short takeoff and landing capabilities (a takeoff run of 336 feet to reach an altitude of 50 feet, and 564 feet to land from an altitude of 50 feet). An impressive rate of climb (2,407 feet per minute) resulted from its new turboprop engine. All of those capabilities were especially appreciated for the low-level flying over mountainous terrain that the target tugs would be called upon to perform. Maxi-mum speed was 268 mph at 10,000 feet, with an economy cruising speed of 217 mph. Empty weight was 5,806 pounds, while the normal loaded weight was 7,275 pounds. By December 1968, when the plane underwent military evaluation, the only further modification deemed necessary was the addition of a small central tail fin to improve stability. The cost-effectiveness of the program exceeded all expectations, although it was not until 1971 that the Swiss military ordered the EFW at Emmen to begin conversion work on the next five examples of what was by then designated the C-3605. A budget of 30 million Swiss francs was delegated to pay for a total of 23 converted aircraft - an order completed by January 1973. At the same time, the target tugs also underwent a change in color scheme to identify them to the anti-aircraft crews—from red striping to broad diagonal black and yellow bands over the wings, horizontal stabilizers and forward part of the fuselage. All 23 C-3605s were still flying late as 1978. The C-3605s began experiencing a disturbing recurrence of forced landings in the mid-1980s, which were generally diagnosed as being due to a loss of torque and overall power. The turboprop engines had worn out before the airframes, and spare parts for them were running low. Rather than re-engining the aging veteran yet again, the Swiss judged it more economical to replace it with a new, purpose-built aircraft, equipped with the latest model turboprop engine and a fixed target-towing installation - the Pilatus PC-9. In April 1987, C-3605s flew their last missions. Engine: Hispano-Suiza HS-51 12Y 12-cylinder, 1,000-hp. ROC: 34 feet per second. TO dist to 50ft: 336 ft.
Ldg dist from 50 ft: 564 ft.